She whispers it softly over a cup of coffee. She pulls me aside and confesses it after a conference. She sends a note to my inbox that shares it. There’s an epidemic of weariness among women today. And the ones affected most are often those trying the hardest. To be good. To keep it together. To please God and everyone around them. So I asked God to help me understand why so many of us have settled for simply making it through the day. And this is what I discovered: We don’t truly believe we’re unconditionally loved. We see love as something we have to earn, which means anytime we mess up or fall short we’re in danger of losing what matters most. Life becomes a tightrope of fear instead of a journey of grace. No wonder we’re so worn out. Thankfully God offers a solution: “There is no fear in love. 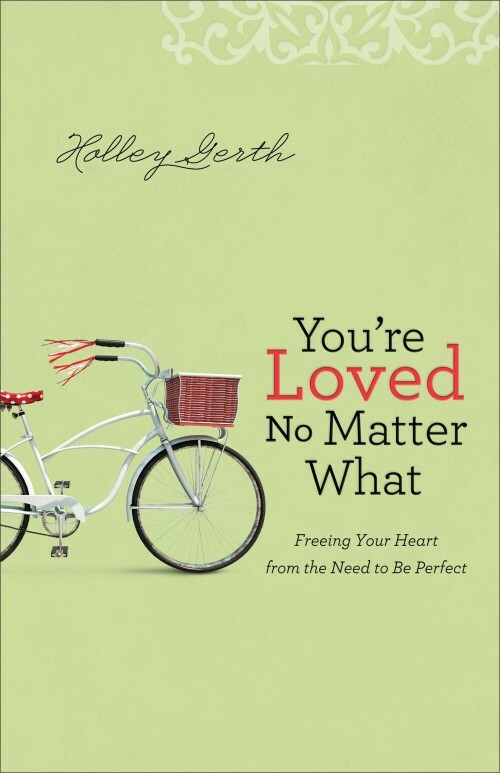 But perfect love drives out fear.” (1 John 4:18) My new book You’re Loved No Matter What: Freeing Your Heart from the Need to Be Perfect explores that truth and will give you the hope, encouragement and practical steps you and other women in your life need. A little disclaimer: I always feel shy about sharing my books with you because this place isn’t about getting you to buy anything. We’re friends and you’re welcome here no matter what. But I can’t hold back about this new one because I believe it has the cure God wants to use to heal our exhausted hearts. And I know it works because it’s changed my life. So what kind of friend would I be if I didn’t tell you about it? Your heart really can be free from the pressure to be perfect. And you don’t have to keep saying “I’m tired” anymore. It’s time for a new way of living…starting today. Oh, Holley! Do not feel shy…you are one of my very favorite authors and I always want to know what you have to say. You have helped me so much in my walk with Jesus through this life. I think this might be the first book for a new book club in which I hope to participate. I love you! Thank you! I’m in a season of learning… or should I say I’m re learning what life and love truly is… it’s a hard lesson to rethink my mind from what it has known all these years but I am being intentional. I would be so sad if you DIDN”T share your books with us! I have read almost all of them and each time I pick one up, I hear God speak to me through your words. Thank you so much for listening to God and letting His Word become flesh in you through your experiences with Him. Can’t wait to read and to review your book on my blog! Thank you. I needed this today. After being sick and falling behind in my schedule as a self employed person who is the only one to actually do the work, I was feeling overwhelmed. I’m going to just spend some time remembering how much I am loved. I can’t wait to read this next one! I have read two others by you and also Love Idol, because of your recommendation and they have helped me so much. I feel like I have had sessions with my own life coach reading these books and journaling. I’m finally getting down to the nitty gritty of my life’s struggles. Like a cavity, I’m drilling out the yuck and asking God to fill the holes. I have so many. And that’s ok. I’ve been waiting and waiting for God to give me “my calling” for doing something for Him. He is calling me to just settle in to being me. To accept this creation he has made, imperfections and all. And that’s enough. Thank you, Holly for sharing your heart once again! Holley, I’m so thankful for your words and your message to women like me, recovering perfectionists. Truly, thank you for sharing. I’m still thinking about a post you shared weeks ago. Holly I would never think of you as being shy when you write such great books that reach the inter-self in women. I have always felt I never belonged because of the abuse I received as a child. If your parents can’t love you then who can? I look forward to getting your book. Thanks for reaching out to me. It seems like if this book was written for anyone it was me.. Love you. Thanks so much for all your encouraging words and celebrating this new book with me! So grateful for all of you! Holley, when you tell us about a new book or other project, you’re simply sharing your good news. That’s what friends do! We greatly appreciate your messages of hope and encouragement–they fuel our souls. Here’s my issue: I know God loves me and does not frown with displeasure when I can’t measure up to PERFECTION. But what about the people in my life? Not all of them are understanding, forgiving, and appreciative of my efforts, like God is. Sometimes I have exhausted myself in order to please them, even though I know it’s not necessary. Do you have a chapter about that? Hi Nancy, I just wanted to comment on what you were saying about others expectations because the thing that came up in my heart when I read the first bit of Holley’s book is that God doesn’t expect me to be perfect, I’m not going to expect me to be perfect and others are going to have to accept that as well – and if they struggle with it ill have to leave that in Gods hands but it doesnt change His truth about me – I wont receive the enemys junk through them! I am going to receive the truth of His love instead and you should too! Love God and love one another. Sometimes those feelings of needing and trying to be perfect stem from us trying a little to much to serve God by our own strengths and efforts. This is a wearisome task and frustrating, but it’s a learning experience. Thank you soooo much!!!! i so needed that! I just love you Holley Gerth! You are beautiful! I just finished this book, which I got from Revell to review. It is amazing. You shared so eloquently what my heart longs for women to know. Following Christ is not about following a list of rules, but about a relationship with One who loves you far more than you can imagine. I so wish that women everywhere could grasp this truth and understand the infinite love of Christ because it would change so many lives. I know it has changed mine. Thank you for writing the book, and don’t be shy about sharing the gift that God has given you! Thank you for your new book. I’m slightly stalled on the previous one but I have bought the new one and have sent two copies – one to my sister and one to my niece. You are making a difference. Keep writing! Congrats on your beautiful book, Holley. I can’t wait to dive in. Praying many captive hearts will be set free by God’s words spoken through you! Love you!! Holley, every time I read your posts they encourage my heart. I have shared your books with friends. It seems you can put into words so many insights. I think I could learn a great deal if I had you for my Life Coach. Is that possible? Thank you Holley. You’re a great blessing to the body of Christ. Oh, how I need to read your book. I have overextended myself and today having to rest and allow my body to restore. I have repented and God has been and is so gracious and merciful! Thank you for your blogs.